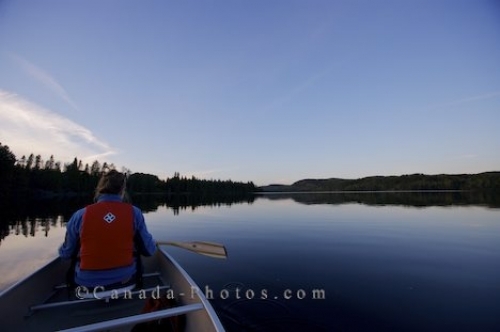 Very little movement is seen across the surface of Whitefish Lake in Algonquin Provincial Park in Ontario, Canada as a woman canoeing admires the scenery and enjoys the peacefulness around her. On the surface, ripples are noticeable where the drops of water fall from her paddle while the sunset lighting shows off the reflections of the landscape on either side of the canoe. The lake has a perimeter of 12.6 kilometers, a maximum depth of 27.0 meters and the best way to see the entire lake is canoeing the area. Around the shores of Whitefish Lake, visitors to Algonquin Provincial Park can find the Whitefish Lake Group Campground. A beautiful place with a quiet beach which is mainly used for youth and special groups where they can experience canoeing, swimming, fishing, sunsets, wildlife and the scenery of the park. Picture of a woman canoeing on Whitefish Lake in Algonquin Provincial Park while enjoying the scenery during the sunset hours.